After setting the reference, you can than use the DAO objects to interact with Data in your database and other databases depending on your connection setting. Note, the sample code below is just a sample and will not work in your Application unless certain changes are made to work specifically with your data objects. 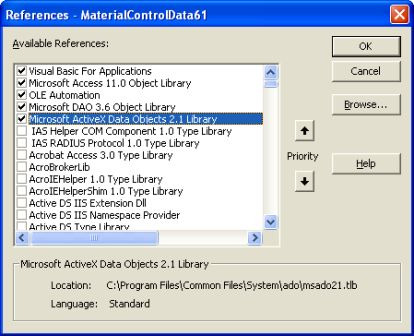 The Microsoft Access DAO Database is a sample database that shows you a number of ways to use the the above function. Please note that this is a template database. If it doesn't meet your needs 100% and you're unable to customize it yourself, let us know and we'll provide a quote to develop the customizations you need to get you exactly what you want in your DAO System. Having problems getting the code to work for you - then try out the demo to see if the demo works for you. Download a demo version for free to try out. The demo version is in Access 2007 which will work on either Access 2007, 2010, 2013 or 2016. If you need a previous version of Access to tryout, please Contact Us. Please note that the demo version of the software is fully functional but doesn't allow you to see the code implementation - the full version allows you to design the code implementation and tweak it for your needs. $19.99 - this allows you to use this database template however you wish within your organization. $39.99 - for unlimited developer use - this allows you to use this database template however you wish for any applications you develop and distribute.